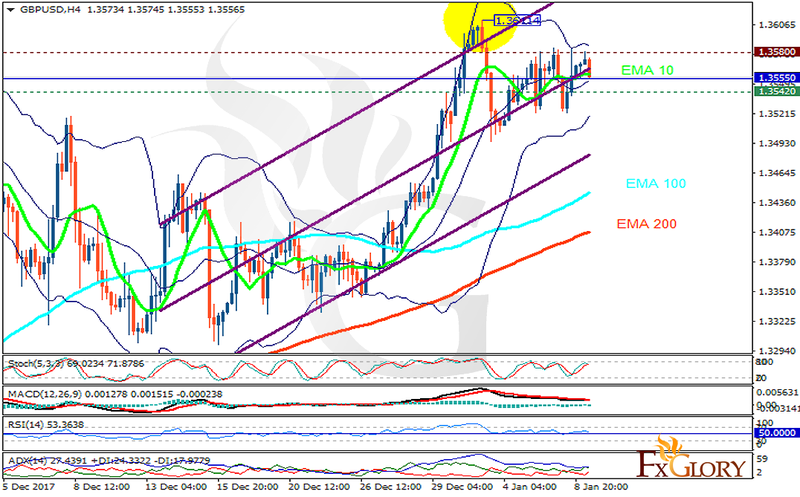 GBPUSD has been consolidating within 1.35 and 1.36 area this week. The Brexit talks are the most influential event for this pair. The support rests at 1.35420 with resistance at 1.35800 which the weekly pivot point at 1.35550 is located in between the lines. The EMA of 10 is moving horizontally in the ascendant channel and it is above the EMA of 200 and the EMA of 100. The RSI is falling towards the 50 level, the Stochastic is moving in high ranges and the MACD line is below the signal line in the negative territory. The ADX is showing buy signals. The indicators are showing mixed signals; the price will be consolidating within the Bollinger bands. If the price breaks the lower Bollinger band, sellers can target 1.33 and if it breaks the upper, buyers can target 1.3650.